This has been a busy, busy week - I semi-moved yesterday - and meals have been quick and easy and nondescript. But this light supper, eaten among half-open boxes and the wreckage of my kitchen, was so simple and good that I had to share it. It's the best cheese on toast I've ever eaten, and felt much less like the exhausted and makeshift meal it really was. 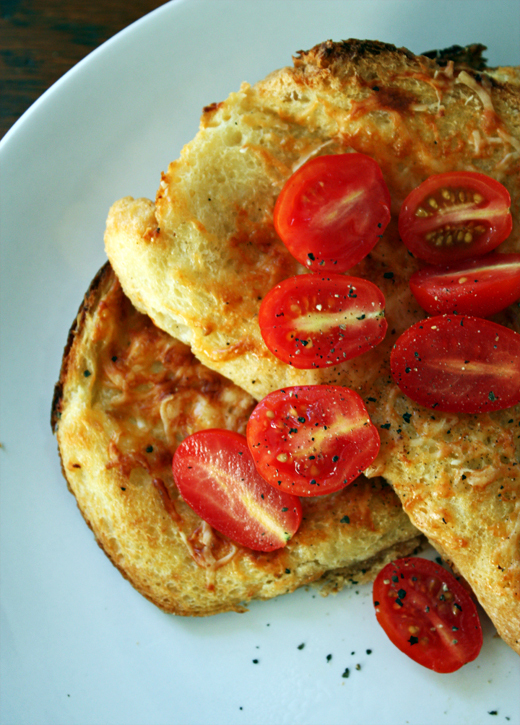 The cheesy top is crusty and golden; underneath, the bread is soft and eggy and light. It fortified body and soul. And it's nice that you don't fry it, too. All my things have been shipped away, and now I have two weeks of living in an empty apartment, which is an odd experience. Not so much out-of-body as out-of-life. I'll only have a couple of pots and plates to cook with, and there's a strange collection of half-opened packets and jars in my cupboard and fridge that I should try to use up before I leave. It might be liberating and inventive and fun, or I might order a lot of pizza. We'll see. Preheat the oven to 200°C/400°F. Butter a small shallow baking dish or pie plate. Arrange bread in 1 layer in dish (it's important that your bread only just fit in the dish). Whisk together milk, egg, and a little salt and fresh pepper. Pour over bread. Sprinkle with cheese. Press the bread lightly to help absorb custard. Let stand until fully absorbed, 10-15 minutes. Dot with butter and bake, uncovered, until puffy and golden, 20-25 minutes. oh my goodness this looks delicious, this might have to be my beginning of the weekend breakfast! 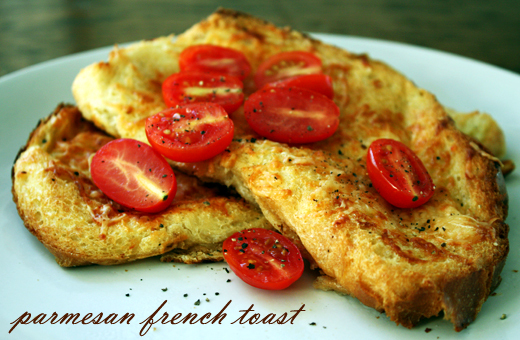 I really like the idea of a savory French toast - I bet this would be amazing with a manchego or idiazabal. That looks so so so good!! It's dangerous to visit your blog on an empty stomach!